Razer has written to HEXUS about an attractive new feature that will arrive shortly for Razer Phone owners. It has been announced that Netflix will be supported with both HDR video and Dolby Digital Plus 5.1 sound on the Razer Phone. Razer is rather proud of this achievement which it says provides "an unmatched mobile theatre experience," and is an industry first. "We engineered the Razer Phone to handle HDR video and sound like no other phone on the market," said Min-Liang Tan, Razer co-founder and CEO. "We are incredibly excited to deliver Netflix entertainment on a smartphone like never before, enabling us to take full measure of the Razer Phone’s HDR10-enabled display and dual-firing, front-facing Dolby-optimized speakers and THX-certified headphone connectivity." To benefit from the HDR visuals and Dolby Digital Plus 5.1 audio in Netflix, Razer Phone users will have to wait until for an OTA update later this January. The update will deliver a new Netflix app and a home screen widget for easy access, as well as firmware improvements targetting screen and sound output. All new Razer Phones from later this month will come with the update pre-loaded. Dolby Digital Plus 5.1 support is said to be a first for a mobile phone, and is usually "reserved for high-end entertainment systems and PCs," says Razer. 5.1 audio exploits five full-bandwidth channels and one low-frequency effects channel and is the standard surround sound audio component of digital broadcast and music. Content coming to Netflix to take advantage of the audio visual fidelity on offer includes; titles such as Bright, Stranger Things 2, and the entire Marvel series. 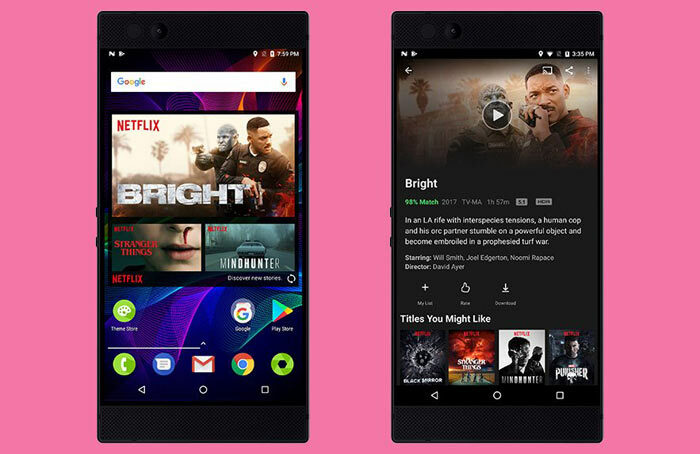 Here in the UK, Three mobile highlights that Razer Phone users on its network can watch Netflix without impacting data allowances thanks to the Go Binge streaming bonus provided to Advanced Plan and pay monthly broadband subscribers. I've got one of those cheapo VR things that you stick your phone in. It's not bad and I do wonder what a decent one would be like with the necessary resolution and HDR, etc. Whilst I'm not a fan of watching proper videos in squint o'vision, I think there may be a use here if it's done right. Three mobile highlights that Razer Phone users on its network can watch Netflix without impacting data allowances thanks to the Go Binge streaming bonus provided to Advanced Plan and pay monthly broadband subscribers. Or you could just pre-load what you want to watch on the go, you don't need Three or an advanced plan for that, just wifi at home. …in standard definition only… which is what, 480p at best?